AeroVironment has collaborated with NASA’s Jet Propulsion Laboratory to develop an unmanned helicopter platform as part of the Mars Exploration Program. 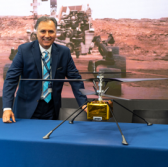 The company displayed during a press briefing at Nasdaq Marketsite in New York City a model of the Mars Helicopter that will be integrated into the Mars 2020 rover, AeroVironment said Tuesday. AeroVironment handed to JPL a landing gear prototype and rotor in May 2016 for integration with a JPL-built controller and then delivered subsystems last year for incorporation into engineering development models of the helicopter drone. JPL developed two engineering development models of the Mars Helicopter for use in flight demonstration and environmental tests. The company said the two drone development models passed tests in simulated Mars environment and JPL has begun production work on the final Mars Helicopter following the tests. AeroVironment designed and built the airframe, landing gear, thermal enclosure and propulsion motors for the drone, while JPL developed the avionics, sensors, flight control and software systems for the Mars Helicopter models. JPL and AeroVironment also worked with NASA’s Langley Research Center and Ames Research Center on the Mars Helicopter project. Wahid Nawabi, AeroVironment president and CEO, said the company has leveraged its ultra-high-precision and ultra-lightweight methods as well as its experience with Helios, Pathfinder and other near-space aircraft to support JPL on the Mars Helicopter program.